With the assistance of our skilled professionals, we are engaged in offering a quality approved array of casted gunmetal bushes. The casted gunmetal bushes we offer is widely demanded their safe use. We provide Gun Metal Bushes for Automotive Industry. 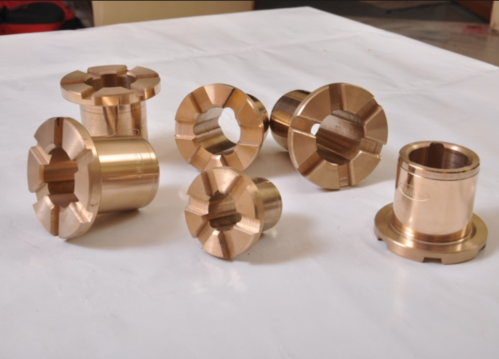 With decades of experience our vast range of products is manufactured using quality raw materials which include sintered bronze, Iron Sintered Bronze, MDU/MDX, Graphite Filled Bronze, Sintered Bronze Bearing, Gun metal, Flanged Bronze Bearing, Phosphor Bronze, Bronze Bushing Bearing, Aluminum Bronze, and many more. We procure raw materials from reliable vendors. In addition, world class technologies and quality approach is implemented in the manufacturing process with effective machinery. We export our products such as bronze bearing, bronze bushing bearing, sintered bronze bearing, flanged bronze bearing in various Gulf countries. Our state-of-the-art infrastructure is equipped with latest machines and equipment, which are handled and operated by able and experienced professionals. We implement stringent quality tests in the production process. Our collective efforts enable us to provide customized solutions to our clients.